TVR was originally founded (as Trevcar Motors) by Trevor Wilkinson in 1947. 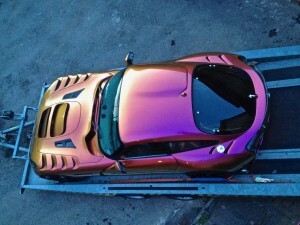 Over the next 12 years, TVR produced a series of unique specials using a mixture of chassis, engines and body designs. In 1959 however, the company launched its first production car, the Grantura Mk1. This car, with its tubular chassis and lightweight body design set the blueprint for all the cars to come and the same core “TVR DNA” could still be found in the cars being produced all the way up to 2006, when the company closed its gates for the last time. From 1959 onwards, the company produced a number of milestone models such as the Griffith, the M Series Turbo (the world’s first turbocharged production car), the Cerbera and lastly, one of the most distinctive TVRs ever – the TVR Sagaris. Sadly, with the dawn of the noughties however, sales began to slow down and in December 2006 the company was eventually placed into administration. There is light at the end of the tunnel however! For in 2013, TVR was bought by Les Edgar and after a 4-year process, teamed up with Gordon Murray and Ford Cosworth to develop a new TVR that will continue the tradition of powerful, lightweight sportscars at an affordable price. The first new TVR model – called the Griffith – will be launched later this year and production will begin at the company’s new Ebbw Vale factory in Wales soon after. 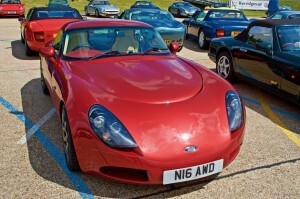 The TVR Car Club has been supporting TVR since 1965. One of the most prestigious single-marque clubs anywhere in the world, the TVRCC boasts over 5,500 members worldwide. Between them, TVRCC members probably own over 80% of all the TVRs still in existence today – a statistic that is hard to beat! 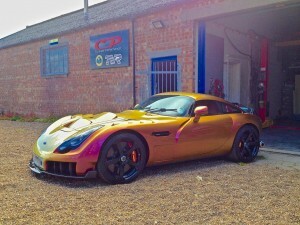 The club produces a multi award-winning magazine called TVR Sprint and have an award-winning website at www.tvrcc.com. The club also runs their own Sprint Championship and provide vital support to the TVR European Challenge race series, so remain close to their racing roots. The club was voted “Club of the Year” in 2015 and recently celebrated their 50th anniversary at the Millbrook proving ground – the only car club to date ever to be allowed to. With the new TVR production car expected to be produced just months away, now is a great time to be a member of the TVRCC! Join us at www.tvrcc.com and see! The very first kit car was built in 1949. A kit car, also known as a component car, is a vehicle that is available as a set of parts that a manufacturer sells and the buyer then assembles into a functioning car. Usually, many of the major mechanical systems such as the Engine and transmission are sourced from donor vehicles or purchased new from other vendors. Kits vary in completeness, consisting of as little as a book of plans, or as much as a complete set with all components included. Most people think of a kit car as it was in the past where a main stream manufacturer’s car chassis had its body removed and then replaced with a kit car manufacturer’s body fitted to make the car more exotic. Some are still built this way today but now-a-days these would be classed as re-body kits. 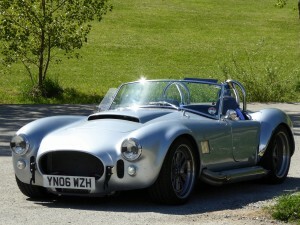 The most popular kit cars at the present time are Lotus seven inspired roadsters and AC Cobra inspired replicas, each of these styles has several manufacturers; however there are also several hundred other styles and models of kit cars, from three wheelers, replicas, sports fun and super car. 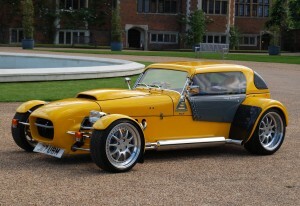 The East Anglian Kit Car Club was formed in October 2007 by a group of kit car enthusiasts. The Members range from some that have built their car from scratch, some that have part built and those that have purchased their car ready built. The Members cars range from a 1970 Dutton Melos to a 2012 Ultima GTR super car. We also have a few three wheelers among our ranks as well. We are also proud to say we have The Mirov II, amongst our ranks, this car was built as a 1:1 mock-up for a TV advertisement for Norwich Union insurance company. Conceived as a fictional sports car from Soviet Union the Mirov II was built by Jon Bunker in two life-size examples. The base of these creations was British UVA M6 GTR kit car. Later, Brian Thompson bought one of these mock-ups and spent nine years to convert it to a driveable road car. The Mirov II received a mid-mounted Renault 2.6-litre V6 engine. Whether you’re looking to build or buy a kit car, have a finished car or you’re still building. We now boast in the region of 100 members from Norfolk, Suffolk, Essex and Cambridgeshire. The club meets at the Jolly Farmers Pub. Norwich Road, Forncett St Peters, Norwich NR16 1LG once per month. We also attend several National and Local motoring shows and fetes each year. The East Anglian Kit Car Club is free to join, however I do collect a donation from members at our area meets.